Painting in Ischia Island, around Aragonese Castle. *this workshop is sold out!! Painting in Ischia Island, around Aragonese Castle. In the footsteps of past and contemporary masters. In the fourth edition of our neapolitan workshop we move into the Gulf of Naples to reach Ischia island and one of its most fascinating places, the Aragonese Castle, a real retreat for painters that want to be inspired to observe and to create. This ancient fortress is located on a rocky little island, connected to the main island of Ischia through a bridge built in the fifteenth century. 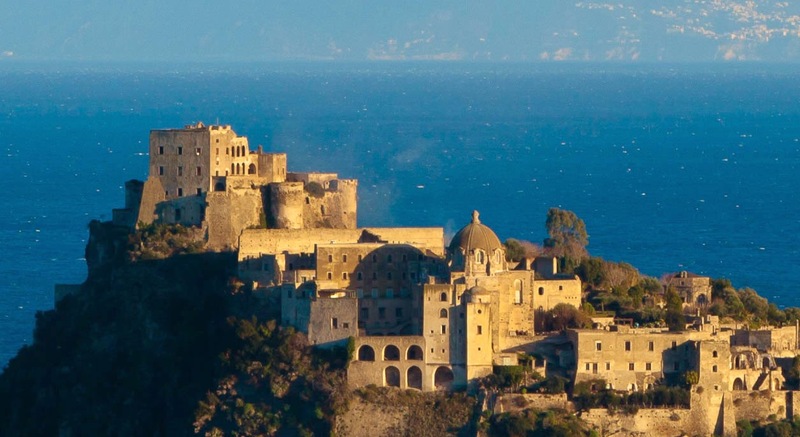 The fortified citadel was made as a defense against pirates and it was the main settlement of Ischia, hosting more than one thousand families, a dozen churches, a convent plus the fortress. Bombed several times, then abandoned and later used as a prison until 1860, the island with its buildings largely reduced in ruins was auctioned and bought by a private in 1912. Currently, the fortress itself is inaccessible but most of the other buildings, four churches and the convent has been restored and are used as a venue for exhibitions and hospitality, there is a restaurant, a café, vineyards, olive groves, cultivated fields, in addition to the headquarters of the European Institute of Restoration. The island is open to visitors all year round. From the top you can enjoy a 360 ° view on Ischia and over the Gulf of Naples. Il programma in Italiano qui. This workshop offers the experience of living three days in a unique environment, to reach a state of flow and concentrate on drawing and painting, in contact with nature, surrounded by the sea and by the vestiges from the island history. Lodging in the old castle monastery, such a quiet environment where time passes slowly, will add a special charm to this experience. Apply before May 31 to get a special discount on Il Monastero hotel rates! UPDATE: Monastero rooms are sold out. In past centuries the Aragonese castle has been a favorite subject for countless artists traveling in Italy for their Grand Tour and landed in Ischia. Can we give new life to one of the most exploited views of the island? This will be the task dealt with Simo Capecchi, rediscovering and reinterpreting those classic views of the Aragonese Castle and searching for new compositions. Inside the Castle was born and lived Gabriele Mattera (1929-2005), established italian artist and son of the castle owner. 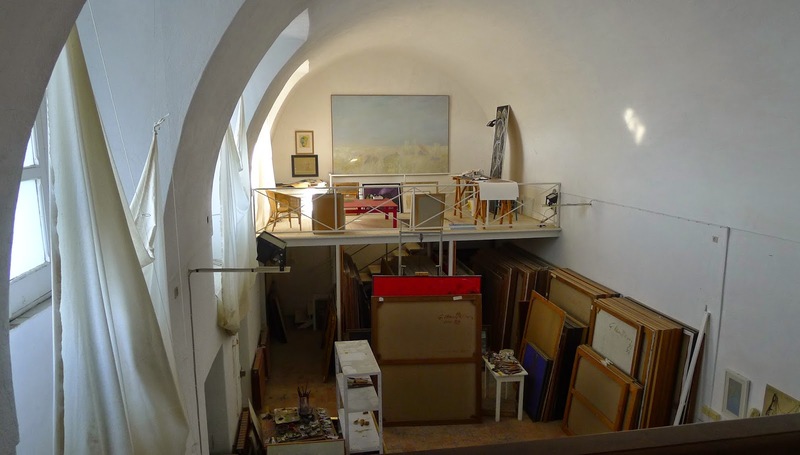 We'll be introduced to his opera by his son Nicola, and we'll visit his studio inside the convent, where hundreds of his large oil paintings are preserved. Although he never represented the castle or his panoramas while he gradually moved away from realism, his works do have a deep connection with the environment where they were made. With Caroline Peyron we will go on his footsteps and will paint plein air in the Castle gardens, observing nature details and fragments of architecture. Participants will be guided by different approaches to location painting. Field sessions will be lead in turn by Simo Capecchi, an architect that likes to paint; Caroline Peyron, a French art teacher and artist based in Naples. Kelly Medford, an American plein air oil painter that lives in Rome, will demonstrates oil paintings technique. Thanks to Franco Lancio for the workshop location idea, for his collaboration and for the graphics! Gabriele Mattera painting in his studio, 1985.
open to the public, guest sketchers are welcome! Please email to marco(at)negombo.it to get the entrance pass. *Negombo, is a botanical garden and thermal bath designed by Ermanno Casasco, famous landscape designer. Thanks to Marco Castagna and the Negombo Thermal Bath for their collaboration and hospitality. Oswal Achenbach, Ischia and its Castle, 1870. Haseltine William Stanley, Coastal Cliffs in Ischia, 1880. The Aragonese castle has been a perfect subject for painters in the late eighteenth century and throughout the nineteenth century. It well corresponds to the aesthetic ideal of "picturesque" adopted at that time, when artists disregarded symmetry and perfect proportions, while focusing more on "accidental irregularity," and start traveling in search of ruins and savage landscapes. The contrast between the dramatic profile of the Aragonese Castle's cliff with its ancient churches and architectural ruins and the quiet atmosphere of the beach below, with swimmers and fishermen at work produced the desired “roughness and sudden variations, joined to irregularity of forms, colors, and lighting”. In past images (etchings, watercolors and oils), the castle is represented mainly from a distance, as a background of the Pescatori's Beach or framed by Sant'Anna's rocks with the foreground filled with groups of fisherman and barefoot kids. Is it possible to deal with such a "picturesque" scenery in a contemporary manner? We will paint it from the same points of view, trying a deconstruction of a typical picturesque composition, each of us with our own sensitivity. The Castle's island and its interiors on the contrary have almost never been represented: bombed by the British in the early nineteenth century and became a prison for most of the century, was inaccessible at the time of the Grand Tour. We will be the first to depict this varied microcosm, creating a sequence of drawings for a possible sketched guide/itinerary to the Castle, from the entrance by the sea level, to its highest point overlooking Naples Gulf, with its olive trees, vineyards, panoramas and ancient architectures. Simonetta Capecchi completed her PhD degree at the University of Naples (Italy) in Architectural Drawing. She currently works as an illustrator. Since 2006, she has curated four editions of "In viaggio col taccuino", an exhibition on travel sketchbooks with conferences and workshops. A selection from this exhibition has been published in book form (Sguardi su Napoli, 2009). Simonetta's sketchbooks have been included in many international exhibitions and featured in edited collections such as Danny Gregory’s An illustrated life (2008). She contributes to Urban Sketchers from Naples, where she lives. We will work inspired by a cycle of paintings by Mattera from late '80, originated by the observation of light colored reflections and the changing forms taken by the curtains in his studio at the Aragonese castle. Deployed as large sails in the sun, or rewound through a system of cables, those tents still protect the studio from direct light. His son Nicola remembers when, as a child, helped the artist to shoot photos of sheets hung out to dry at different times of the day and night, studies that long after generated this series of paintings. In this operas there is a progressive abstraction, both in forms than in the use of the color itself, when the white of the tent breaks down into pure colors. An extreme synthesis that comes from a deep and "silent" observation of reality and well transmits the sense of suspended time that we perceive inside the castle. We'll dispose some sheets in various places of the castle garden, fixed on bamboo poles that grows on the spot, to work on the colorful vibrations that are created between the white tent and surrounding colors, using ink and oil pastels or collage. Another source of inspiration will be the rocks and marine vegetation as seen watching the sea from the top of the Castle terraces, which create interesting shapes, transparencies and color variations. Caroline Peyron is a french artist living in Naples. Personal exhibitions of her works has been held in Naples at the Grenoble Institut Français, Biblioteca Nazionale, Castelnuovo and Museo Archeologico Nazionale; in Rome, at Istituto Nazionale per la Grafica and in Paris. She has been an art teacher and has held workshops for private schools and public institutions for over twenty years now. She has art classes with children, adolescents and adults both in private schools and in cultural institutions like Museo di Capodimonte and Museo Archeologico Nazionale of Naples. She is currently publishing her works with "Il filo di Partenope" art editions. Though there are many aspects to putting together an oil painting, we will focus on values and color. After lightly sketching out the main shapes with a neutral mixture, we will work with big shapes, massing in our darks, lights and middle tones and adjusting from there. Values mean the steps from light to dark on the gray scale. This is the first thing to think about in a painting before color - how light or dark is something in relation to the overall scene. Most paintings, even the most masterful, incorporate approximately five values, seven at most. Even though variation is included in each of these values, unity must be maintained in order for the tone to stay firmly in its place on the grey scale and relate to its surroundings. This exercise also has an added benefit: it helps us to start thinking in blocks of value shapes rather than lines. The main thing that we will be focusing on with color is how to make your mixtures lighter or darker and warmer or cooler. Using only primary colors will help immensely in your color experiment and exercises, harmonising and unifying them more readily, making the mixtures related and tie together. We will practice how to make our color mixtures be in sunlight versus shadow - sunlight is warm and shadows are generally cool - and to create distance going away from us in space. Participants: max 30, min 12. Any level is welcome! This workshop is about sharing and getting a stronger motivation to paint and draw. Any supplies participants normally use are fine. We'll use pen, ink, colored pencils, pastels, brush pens and watercolors. Ink, ink pens, colored pencils, glue, cutter for Caroline's workshop. A painting oil kit will be suggested later on by Kelly Medford. SPONSOR: thanks to Moleskine for the sketchbooks donation! !